You’ll receive an email containing a link for assigning your password. Click on the link, enter your password twice and submit. You should get a message that your password has been successfully changed. Click on your name in the upper right-hand corner of the screen. You’ll see the information that will be shown as your profile. 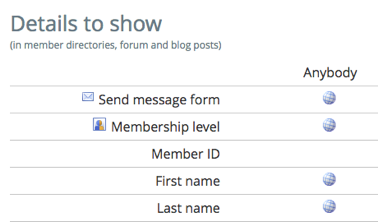 If you’d like to make changes to your profile or the directory listing text that shows underneath your name in the Members Directory page, click on the “Edit profile” button. Profile information – feel free to change any of your information. Photo – You may upload a new photo or change the one that’s there. For best results, uploaded pictures should be sized to 110x110 pixels. Click the “Browse” button and select the photo file on your computer. Directory listing text – please keep this short as it will be shown on the Members page. Your company description which is shown on your profile page can be more detailed. Click on the “Edit profile” button. This describes who can see your information. You have the choice of Anybody – meaning the general public when they come to the website, Members only when they’re logged in, or No access to anyone. The filled in circle is the default. Click the appropriate circle if you’d like to change the default setting for any field. Click on “Edit profile” button. Check or uncheck the boxes as desired and Save. Have problems changing your Profile? Wisconsin Women Entrepreneurs Southcentral Inc.